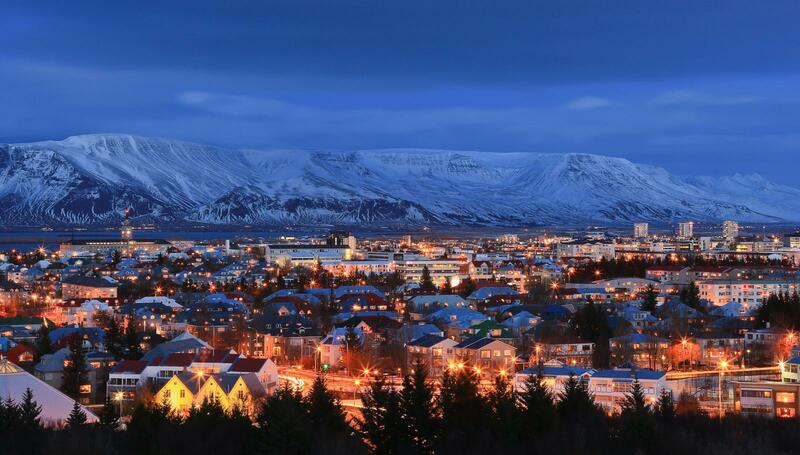 The capital and largest city of Iceland, Reykjavik is also the northernmost capital of any sovereign state. Home to 120,000 people, this small city is Iceland’s cultural, social and artistic heart and considered one of the cleanest, greenest and safest cities in the world. A beautiful city in its own right, Reykjavik also provides an excellent base from which you can explore Iceland’s dramatic landscapes, such as Buri Cave and Gulfoss. 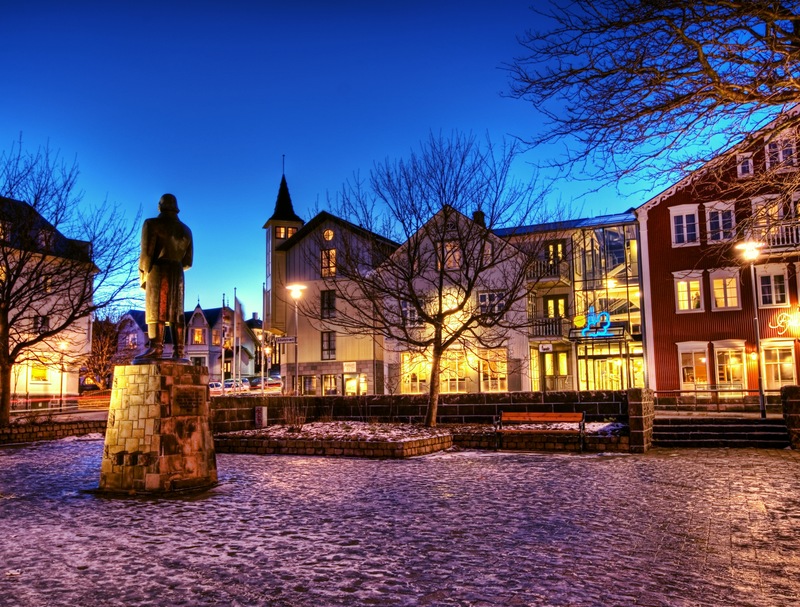 This city was originally founded in 1786 as a trading port but a permanent Norse settlement is thought to have been established around 870 AD by the Norwegian, Ingólfur Arnarson. Originally ruled by the Danish Crown, urban development in Iceland began in the 18th century as domestic industry was stimulated progress on the island. Initially a wool industry was set up in the 1750s and was Reykjavik’s most important employer, along with fisheries, sulphur mining, agriculture and shipbuilding industries. Although the Danes abolished monopoly trading in 1786, with this regarded as the date of the city’s founding, they continued to dominate trade and expanded business across Iceland. During the 19th century Icelandic nationalism became widespread and Reykjavik served at its heart with the majority of important independence events occurring in this, Iceland’s only, city. In 1845, Alþingi, the country’s general assembly returned to Reykjavík, establishing the city as the capital of Iceland, and in 1874 gained some legislative powers when the country was given a constitution. In 1904 the office of minister of Iceland was established in Reykjavik and Iceland became a sovereign country under the Danish Crown in 1918. During World War II the city was occupied by Allied forces who encountered no armed resistance, despite the Icelandic Government declining former requests for occupation by the British due to their ‘Neutrality Policy’. The occupation, however, was economically positive for the city with construction work abundant and the unemployment of the Great Depression years declining significantly. In the post-war period the development of Reykjavik has accelerated with rural migration to the city and improved living conditions spawning a transformation, particularly in the financial and information sectors. 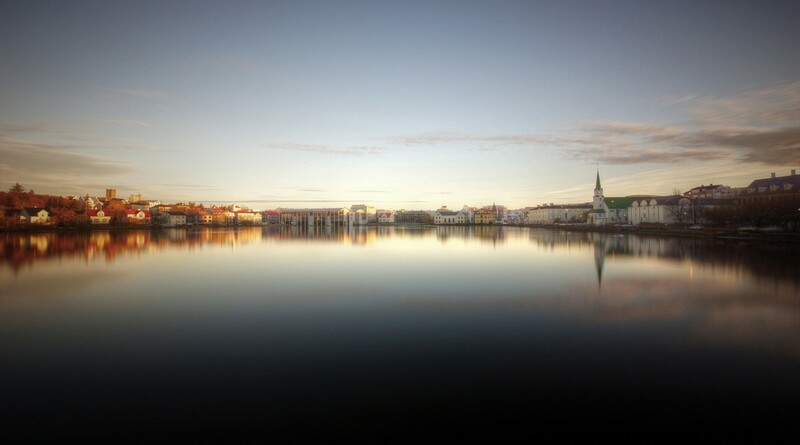 Reykjavik is also famous as home to a number of artistic talents such as Björk, Sigur Rós, and poet Sjón. Located in the southwest of Iceland, the city of Reykjavík is mostly located on the Seltjarnarnes peninsula, although the suburbs spread far out to the south and east. The Elliðaá River runs through the city while Mount Esja dominates the skyline at 2,999 feet. While the retreat of glaciers over the city area following the Ice Age caused the land to rise significantly, the area of Reykjavik city continued to be shaped by the forces of nature, particularly earthquakes and volcanic eruptions that are notable occurrences throughout the island. The Gulf Stream maintains a relatively mild climate with winters rarely dropping below −59 °F (5 °F) and summers between 10 and 59 °F (50 and 59 °F). Although the city does not experience a lot of rainfall, it is prone to wind and gales. 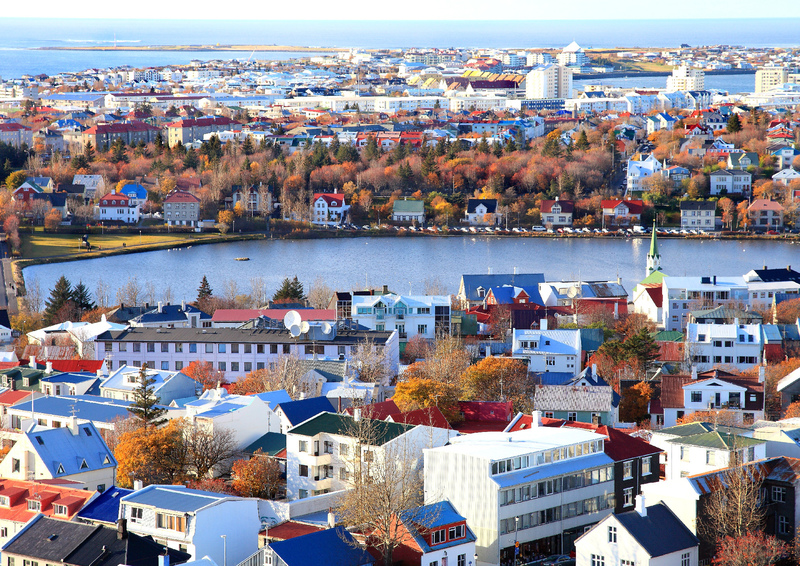 Iceland’s largest and most populous city, Reykjavik is home to people from more than 100 countries with the most common ethnic minorities including Polish, Filipinos and Danes. An economic boom over the last decade known as the ‘Nordic Tiger Years’ led to an increase in construction and redevelopment projects in the city. In 2009 the city was listed by The Economist Group as the richest city in the world. Home to a number of excellent museums and art galleries, as well as impressive architectural designs, Reykjavik is a great city to explore on foot. Its brightly painted wooden buildings, together with plenty of open spaces and parks, make for an aesthetically beautiful mix. Don’t miss feeding the ducks at Tjörnin, the ‘pond’ in the centre of the city, or a visit to the Royal Botanical Gardens in Laugardalur. There are daily free walking tours which depart from the Tourist Information Centre, located in a beautifully renovated old building by Ingólfstorg, which take in the main sites with a good dose of history. While you are at the Tourist Information Centre, grab some maps and information on local sights as well as current events being held. Reykjavik’s main shopping strip, Laugavegur, extends across the centre of the city and is home to its most interesting shops. From fish-leather handbags to volcanic stone jewellery, this is the place to get unique Icelandic souvenirs or just window shop at the weird and wonderful things on offer. By day the area is busy with tourists and by night locals fill up the local restaurants and bars in the streets surrounding it. 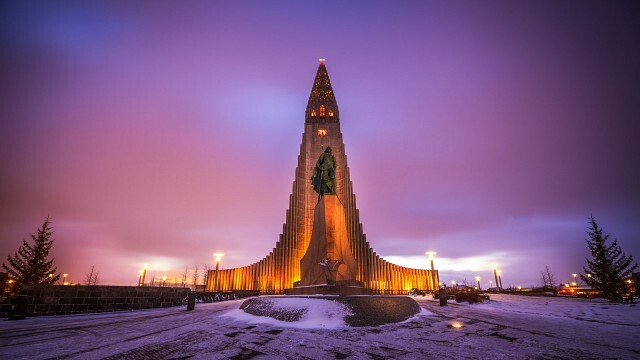 This iconic church in Reykjavik is Iceland’s tallest and largest church, with its futuristic design atop Skolavorduhaed hill drawing thousands of tourists each year. Its construction began in 1945 and it was named after the 17th century hymn writer and church scholar, Reverend Hallgrímur Pétursson. It is a working church and free to enter, both during services and outside of these times, and there are free concerts throughout June to August which showcase the church’s beautiful organ. For a small fee you can climb to the church’s tower for impressive views over the city or take a tour around the building. One of Reykjavik’s many museums, the Einar Jónsson Museum exhibits the work of this Icelandic sculpture. His work draws on the country’s myths and folklore and is considered both challenging and captivating. There is both an indoor and outdoor space within the museum complex which is open Tuesdays through to Sundays during the Summer months. This flea market, located on Reykjavik’s northern harbour is a vibrant mix of Icelandic specialty produce, bric-a-brac and vintage gems. Held on weekends between 11am and 5pm the market attracts a mix of both tourists and locals to peruse the wares and find some unique Icelandic bargains. This is an interactive museum that details the history of the island, from its pagan roots to progressive Icelandic fashion and pop culture of today. It presents typical ‘locals’ from different eras in Iceland’s past who tell you what life was like for them and offers an engaging way to experience Icelandic history. The museum is open between 10am and 5pm during the Summer months. If you are visiting in Winter then you may get lucky in witnessing the Northern Lights - emerald green strips and swirls which illuminate the long, dark Winter nights. They are believed by scientists to be the colliding of ‘electrically charged particles from the sun that enter the earth’s atmosphere’ and for the clearest views it is best to venture a little way outside of Reykjavik where the city’s light pollution won’t obscure your view. These natural outdoor hot tubs are a great place to soak weary trekking muscles within the city. Heated naturally by geothermal waters, the complex includes a number of tubs to relax in, as well as a lap pool for swimming. Reykjavik is a good spot to embark on a whale watching tour which depart daily from the city’s old harbour. Minke and humpback whales, together with dolphins and porpoises are most commonly sited, along with an array of birdlife. Tours typically last around 3 hours and costs from 7000-8000 Icelandic kroner. From Reykjavik, the Golden Circle tourist route is one of the most popular day trips - a 186 miles (190 mile) road trip which takes in some of the surrounding region’s best sites. Visit Thingvellir National Park, the impressive Gullfoss Falls and the geothermal Haukadalur Valley which includes the famous Stokkur geyser. You can either hire a car and go at your own pace or there are plenty of tour companies which make the excursion from Reykjavik daily. Located just under 31 miles from Reykjavik, the Blue Lagoon is one of the country’s most popular tourist attractions. This geothermal mineral spa is a place to soak up the beneficial health properties of the emerald waters and lather yourself in silica mud, believed to exfoliate and nourish your skin. Entrance includes access to the hot lagoon pools and specialised spa treatments can be enjoyed for an extra cost. The Blue Lagoon is open from 9am to 9pm during the Summer months. While Reykjavik is a relatively expensive city, dorms are available for around 3000kr a bed at Reykjavík Backpackers and Reykjavík Downtown Hostel. For those looking to splurge the Radisson Blu Saga Hotel and Hótel Borg offer 5 star luxury in the 30,000kr plus price range. Rekyjavik can be an expensive place to eat so if you are on a budget it's worth considering self catering and sticking to the supermarkets. Hot dogs are popular and sold all over the city making for a cheap snack. There are an abundance of reasonably priced cafes throughout the city that offer free Wifi and are a great place to warm up with a hot drink or a number of Thai restaurants offer relatively cheap and large meals. There are great fish restaurants down on the harbour that sell freshly caught produce, as well as upmarket dining options throughout the Old Town that offer cuisine from throughout the world. Laugavegur is the city's main shopping street where a number of Icelandic designer boutiques and artisan shops are located. The streets that radiate from here are home to souvenir shops, bookstores and record shops. On the weekends there is a big fleamarket in a warehouse on the harbour that sells everything from clothes to books to antique furniture, as well as a food section where you can pick up Icelandic specialties such as smoked and pickled fish. Reykjavik is served by two airports - Keflavík International Airport links Reykjavik to major European cities and North America, and Reykjavik Airport services domestic routes. A shuttle bus meets most flights to transport visitors to the city centre. If you plan on exploring beyond the city's borders it might be worth hiring a car for flexibility. There are a number of rental companies in Reykjavik (and at the airport) with prices starting from 5,500kr per day. If you are just staying within the the city, a well-organised bus system makes it easy to get around. Straeto runs services all over town with single tickets costing 350kr (valid for 75 minutes). The Reykjavik Welcome Card allows unlimited use of the bus system, together with access to a number of museums and free internet access at hostels. Available from the Tourist Information Centre, and some hotels, a one day card costs 2,900kr, two days 3,600kr, and 3 days 4,200kr. Long term passes are also available, up to 9 months. Public buses travel around the city and to limited sites around the island but exploring the city by foot is the best way to get around due to its small size, the close proximity of sites, and extensive parks and gardens throughout the city.